Mt Rosea is now open for climbing only. (Details here from when it was closed. ) Whilst CliffCare has repaired the climbers access track there is still work that PV need to do on the official Mt Rosea walking track and this is still currently closed. Contractors have been engaged. Climbers do need to use the beginning of the Rosea Walking track though in order to reach the climbers access track to the climbing area. 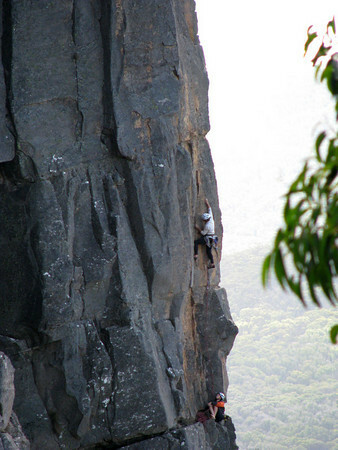 After discussions with Parks Victoria, they have agreed to let climbers use the walking track in order to do this. Please be respectful of this and don’t access any other part of the main walking track or the area itself. There are many user groups that love Rosea and are unable to use the area currently because of it’s closure. Silverband Road is now open and road access to the area is as normal. This entry was posted in Grampians and tagged grampians, mt rosea, reopenings by Tracey. Bookmark the permalink.